The Biodegradable Products Institute is the current standard in the U.S. for composting. 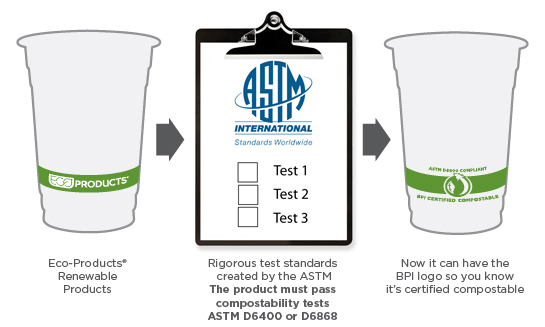 BPI and the US Composting Council uses the American Society for Testing and Materials (ASTM) standards to certify products as compostable. We test all our GreenStripe® products and put the BPI logo on them so it is easier for you and your commercial compost facility to identify compostable items. This standard applies to products made from plastics that are designed to be composted in commercial composting facilities. This standard covers laminated paper and sugarcane (bagasse) items that are designed to be composted in commercial composting facilities. Eco-Products® is committed to getting a third-party stamp of approval for compostability because it’s critically important to us that our products compost properly. In addition to seeking certification, we also work with composters and other stakeholders in the industry to better understand real world conditions and the ideal composting environment for our products. Basically, we’re super into composting and are working hard to ensure the ideal end-of-life scenario for our products.